From the company that brought you the super popular AfroHamster series, a new app! 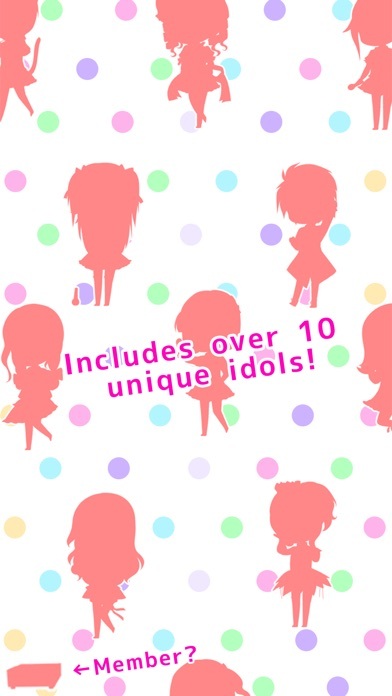 Create an infinitely growing group of kawaii Idols! Follow in the footsteps of famous Idol groups like AKB48 from Japan in a new endless Clicker-style action game! You are the producer of a new Idol group! Raise them to be Pop Stars! 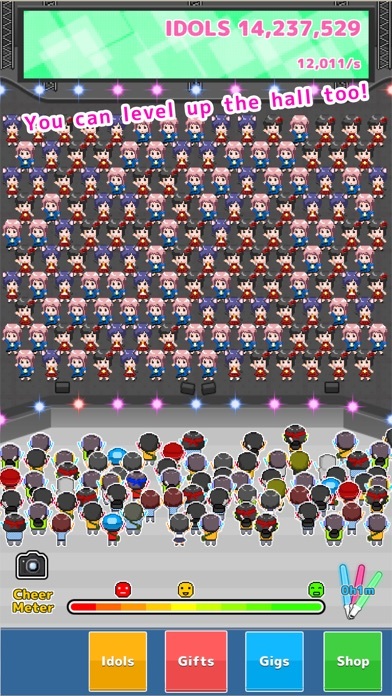 Tap the stage to cheer and support with your fans, then hire more and more members to create an infinitely growing group of billions and billions of cute and pretty singers and dancers! The game is simple: 1. 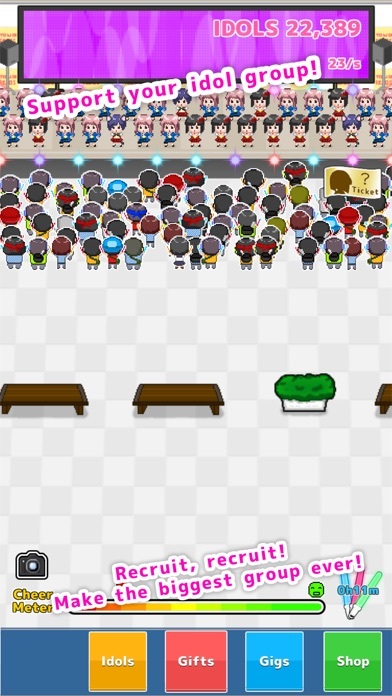 Tap the stage to cheer along your members with your fans: More and more idols will join your group! 2. Once you have enough you can hire new members, bringing in even more idols over time! Ever played Cookie Clicker? Then you know how this game works already! ■ Features to get excited about ■ ▼ Empower your favorite Idol! 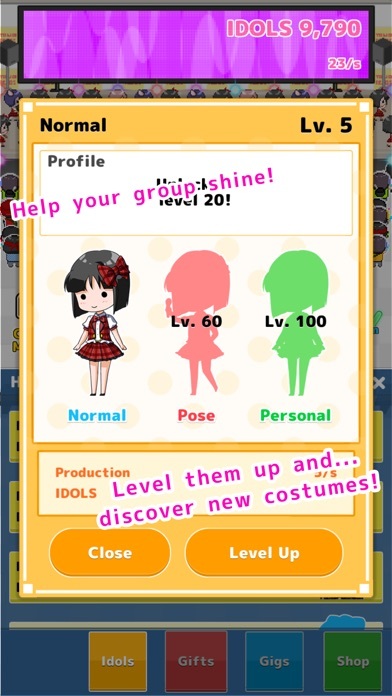 Lots of different personalities will join your Idol group: a lazy one, a girl more interested in her nails... each has their own profile and cute pictures that get unlocked as you level them up! Each member of your group has her own style! See them all dance on the stage together! As you have your members graduate by spending your idols, your group will grow at a faster and faster rate! Each new stage unlocks new songs and dances! ▼ Fever and dash your way to fame! Watch as your idols dance to the music! Even more songs and special effects appear during Fever Mode! Play DJ by entering Fever Mode! Use Handshake Passes (a Japanese phenomenon where fans use these passes to get to shake hands with their favorite idols) to induce fevers instantly! The fans and Idol Otakus will cheer your idols to fame! Idol Otakus increase the amount of idols that join when you cheer with your fans by tapping! 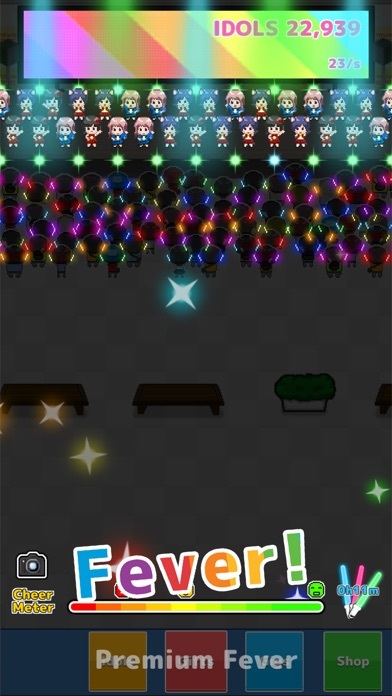 ▼ Upgrade the stage to have more and more idols dancing! Starting at a small 2-line venue, increase the size of the stage onwards and upwards as your group becomes more and more famous! Check out your idols dancing as the number of idols on the stage grows and grows! It is a spectacle to behold when the screen is filled! Work your way up to a giant arena! ■ How to play ■ ◯ Name your Idol group! Choose a name to appear on the giant screen at the back of the stage! This will be your group name, and the name of the main currency you use throughout the game! ◯ Starting off small; a tiny egg of a group… At first your group of idols is small, with no more than 50 members. Tap to support your girls and cheer along with your fans to both attract new idols (currency) and raise the Cheer Meter! The higher the Cheer Meter the faster new idols (currency) will join your group! ◯ A new member appears! Once you have enough you will be able to buy your first new member from the Idols menu! Buying and leveling up members increases the speed at which idols (currency) join your group! Even when you aren't playing! But be sure to keep the Cheer Meter at maximum to ensure maximum efficiency! As you unlock more members you will see them appear on stage with your other idols! See them dance, see the girls spread their tiny wings! ◯ Give them a handshake! You can purchase Handshake Passes to start special effects, such as calling in Idol Otakus to get your fans raving and increase the amount of idols (currency) that tapping gains you! You can even receive Handshake Passes for free from special events! Keep an eye on the right-side of the screen for when the special event button appears! ◆ Recommended for ◆ Filling the gap on the commute to school or work, waiting for the train or bus… Ever dreamed of the fame of being an Idol in Japan? Now you can experience it! People wanting the relaxation gained from a simple game system; just tap away! ESPECIALLY if you love Japan! Anyone wanting to play a free game with a subtle story, perfect for the inner Japan geek in you! ※ This app is not related in any shape or form to official idol groups in Japan (such as AKB48) or anywhere else in the world. I cant find a settings in the game. I dont know if i just cant see it but as far as i know its not there. I like to listen to other music while i play games but i cant find the settings to turn on mute. Other than that i love the game! You'll love this game, it's like cookie clicker but super cute! It's addictive though so be careful! It does crash frequently, however. I'm constantly checking in to see how many points I have. I'm trying to get all the current idols to level 100! I'm at 99 with the Gothic right now. I would really love for their to be more idols, as I've bought all the available ones. This game is very addictive and I'm constantly looking forward to new updates. All the idols are so adorable!